A dramatic image of the floods by The San Francisco Call’s artist. 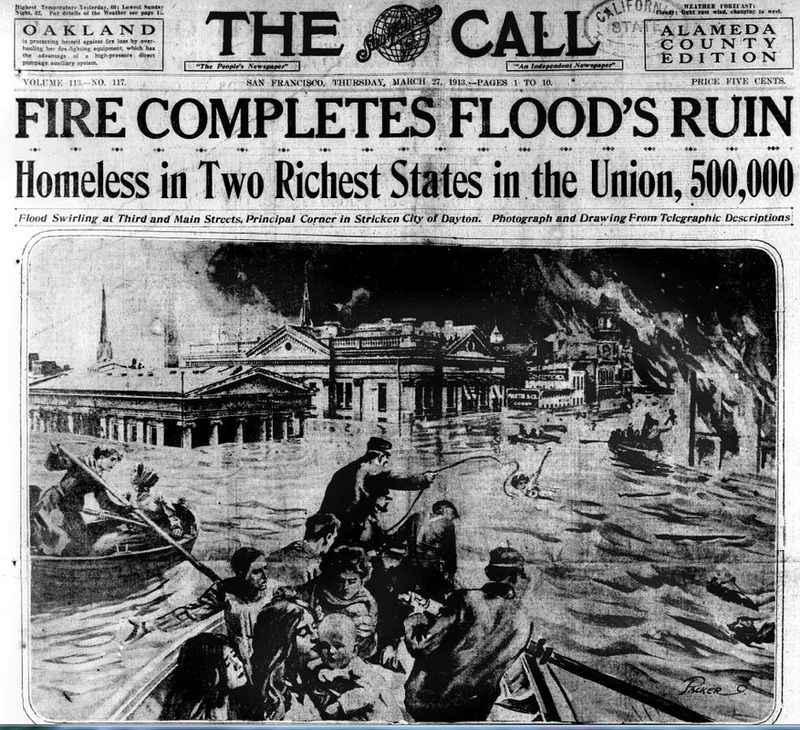 In 1913, Ohio experienced an astonishing natural disaster following several days of torrential rain. Major rivers in the central and eastern United States flooded from runoff and most cities near rivers were badly affected. There were hundreds of deaths and around a quarter of a million people were left homeless. Main Street in Dayton, Ohio, March 1913. The Imperial Glass factory at Bellaire, was inundated by the floods and much damage was caused. The ad below, left, from the Brooklyn Daily Eagle, June 1, 1913, shows the factory surrounded by floodwaters. The text states that 28,000 barrels of glassware were submerged, damaging the packing but not the glass itself. Consequently, the ad offers a wide selection of Imperial glass at half price. Although iridised glass isn’t mentioned specifically, it’s almost certain that it would have been in the flood damaged stocks, as 1913 was a prime time for Imperial's production of Carnival. Who knows.... maybe a Zippered Heart set like the one below right, emerged from one of the salvaged barrels (photo courtesy of Seek Auctions)! In 1926, sandwiched between the overcoats and the corsets for “stout figures” we find a special display of Jacobean Glass in Thornton’s Arcade, Leeds in Yorkshire. 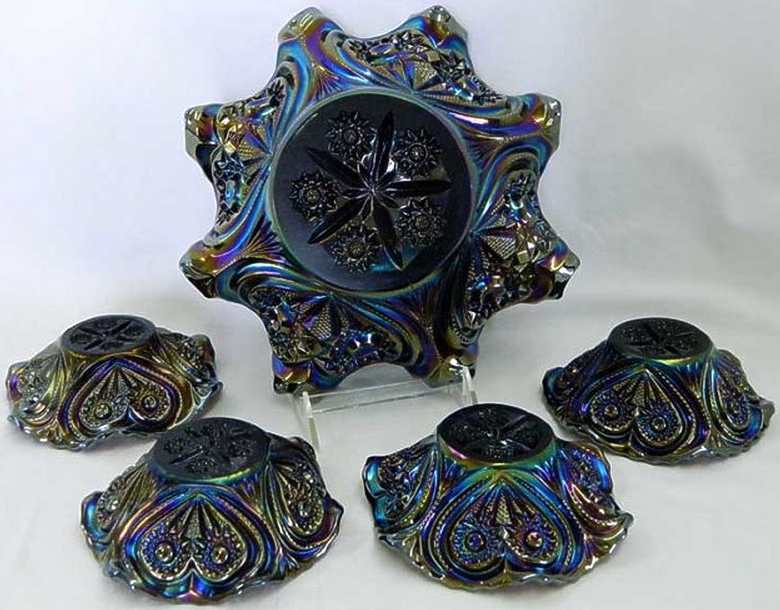 The glass was made by the Josef Inwald factory in the former Czechoslovakia – and the pattern (variously named “Lord”, “Milord” and “Jacobean”) was first made by them in 1921. As well as clear glass, Jacobean was also made in Carnival, as the catalogue extract shows. 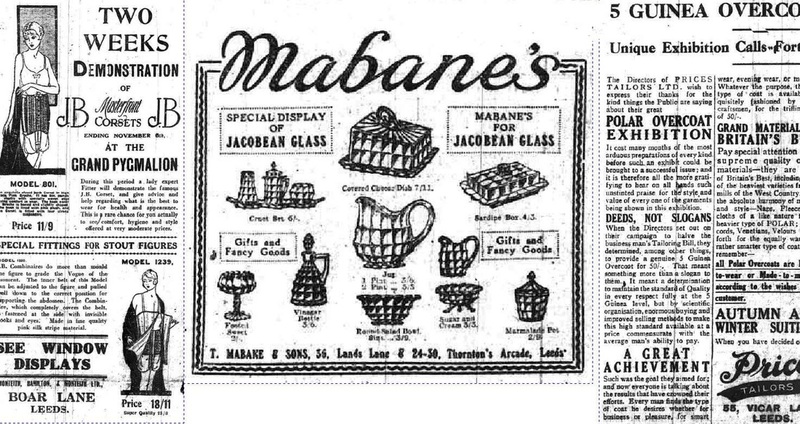 The pitcher and bowls shown in the ad are known in Carnival, as are vases, tumblers, decanters and a whole range of dresser set pieces. This is a marigold “Jacobean” pitcher as illustrated in the 1928 Markhbeinn catalogue of Inwald’s glass. The glass is described in the catalogue as “Ambre Irisé” – Carnival Glass! Note that Markhbeinn called the pattern “Milord”. Thornton’s Arcade, Leeds, 2010, courtesy and copyright Michael Taylor (Licensed under Creative Commons Attribution-Share Alike). Read more "Read All About It!"